Akin to the three-sided security sticker on DVDs, the "Squeeze & Shake" case used by rental joints to "protect" slipbox VHS is a bane to tape collectors. They do a reasonable job of keeping a box in decent condition from grubby renter fingers, but as they age they often become yellowed, scuffed, and scratched. 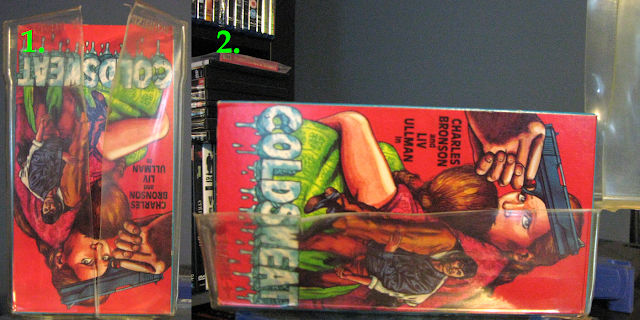 Either for the sake of ridding their VHS of such ugliness or uniformity on the shelf, most want to free these tapes from their plastic prisons. But for those that have tried, you're probably well aware of how deceivingly hellish it can be to remove fragile slipboxes without irreversible cardboard damage. It's not too difficult, but the surgery does requires scissors, a little muscle, and most importantly patience. Being hasty could result in a forever damaged box. The most harmful area is the open bottom where you're supposed to squeeze the sides of the case to let the cassette slide out while keeping the box within the plastic. The box is held by a (usually) sharp ridged edge. The most often cause of damage is this edge tearing at the cardboard 90° angles when sliding the entire box out. Expensive tapes have been ruined this way. First, look at the bottom "open end" of the case. See that little indent at the center? Carefully start a vertical cut with the scissors right out the middle. With some gentle muscle, hold both sides and peel them up toward the top, stopping when you've reach the top. The key is to pull the two sides apart slowly and avoid the temptation of overusing the scissors. Carefully repeat on the other side. The hard part is over and both the front and back of the Squeeze & Shake sliced down the middle. Now there's two ways you can remove the box. The bottom end should be open wide enough to slide the whole thing out with scraping any edges (1.). If not, you can bend one of the sides around (2.) like a can of soup and remove the box that way. Remember to still be careful here, these damn things are like friggin' barbed bear traps. Preferably, it's advised to promptly burn the Squeeze & Shake once finished. I bought a ton of VHS from Hollywood Video when they went out of business, so I had a lot of practice pulling these off usually without using scissors (althoug sometimes it was necessary). A lot of times I would pull the tape out first and stick my hand in the plastic and pull out the cardboard without crushing the box. I haven't seen that Cold Sweat cover before...that's amazing.